The Struan Inn was built in 1863 by the Duke of Atholl to serve the nearby Struan Station (now closed) when the Perth to Inverness railway was first constructed. Guests would arrive by train, stop for refreshment or stay overnight and then continue their journey by horse-driven coach. 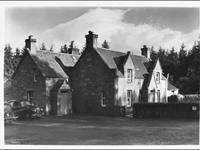 Many of the shooting parties in Victorian times would have stopped at the Struan Inn before heading off to the numerous shooting lodges in the area. Over the years the Inn has had a checkered history enjoying periods of popularity as well as becoming less well known and frequented. Its peak in recent years would have been during the construction of the A9 road and also when the Calvine Caravan Park was open and welcoming tents and touring caravans. Bob and Mary-Ann purchased the Inn in 2012 with an aim of transforming it into a busy and popular venue for both accommodation and food, once again making it a focal point in the local community. 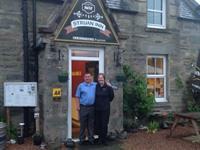 As a local lad, Bob remembers the Struan Inn in its heyday and wanted to put the place 'back on the map'. Refurbishment projects have been ongoing over the past five years with new en-suite bedrooms opened on the first floor, a new reception area, introduction of the Deerstalker's Lounge and an expanded dining area with the Clachan and Errochty restaurants. The project this winter has been to install a new commercial kitchen. The business has been growing steadily and we are delighted to have won the award of Luxury Hotel of the Year for Perth and Kinross in 2018. We thank our regulars for their continued support and look forward to welcoming new customers this year. Managing the Inn is owner Mary-Ann. Her background is actually in manufacturing engineering, but since her specialist area was in process improvement she has applied this to successfully turning the business around. Mary-Ann will often be seen at Reception welcoming guests. Behind the scenes is Mary-Ann's husband Bob. He works for a local sporting estate and will usually only be seen at weekends, but he enjoys greeting guests and telling people about the local area. There's not much that Bob doesn't know about Calvine and Blair Atholl! Our Head Chef is Anthony Bristol who joins us from Peterhead. Anthony is a young up-and-coming chef who has won several prizes for his food and has cooked for a number of VIPs. Our new Front of House Supervisor is Evelyn Orr who has come across to join us from the Isle of Bute and Debbie McLauchlan from Kinloch Rannoch is with us for the months of April and May as General Assistant. We are now recruiting and posts include Commis Chef, Housekeepers/Restaurant Assistants. Accommodation is available, although own transport is required as the staff house is located 2 miles from the Inn. part-time positions are also available. If you would like to be part of a friendly and enthusiastic team, with a passion for Highland hospitality and great food, then get in touch. For more information, phone us on 01796 483714 or e-mail us at thestruan.calvine@btinternet.com.